Reserve Campania Hotels: save up 70% on rooms! The Romans called this wonderful region Campania Felix due to its beautiful landscapes, its pleasant, permanently spring-like climate, its fertile soil and the wonderful aromas and colors that filled ones senses and revitalized ones mind. Travelers can still see all those things that the ancient Romans loved today: Campania provides you with the possibility of spending time on nature, artistic and archeological tours, and also of trying the real tastes of its prestigious food and wine traditions. 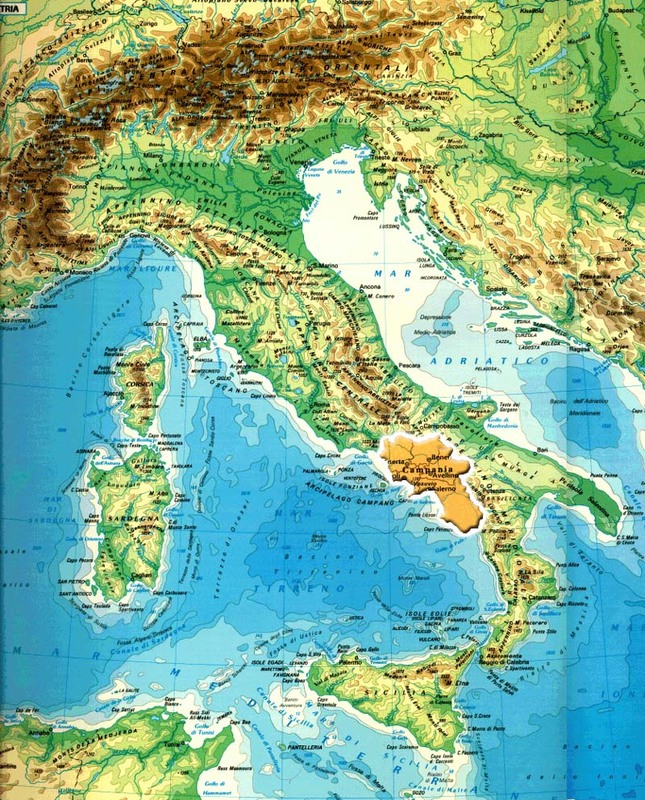 Campanias history dates far back, to the 9th century B.C. when the city of Partenope was founded. This regions greatest moment in history was during the Roman Empire, when famous, wealthy people from Rome came to this area to visit the thermal spas. There are still traces of those centuries today, in spite of the devastating eruption of Vesuvius that covered all the nearby towns with a thick layer of lava in 79 A.D. A visit to the ancient towns of Pompeii and Herculaneum, where important monuments and Roman temples were discovered after decades of digs, is a must for archeology lovers. One also has to visit Naples in order to understand the true essence of this region. Naples is a lively, friendly, sunny city, full of artistic and cultural interest with its theaters and museums, its monuments and its palaces, its typical alleys and open-air coffee shops in the squares. Naples is the place that sums up all the regions culture and history, living proof of the populations that ruled this area over the centuries, from the Anjou dynasty to the Bourbons, with the Aragons somewhere in between. Another wonderful place to visit is the Reggia in Caserta, about 30 kilometers from Naples: this palace was the summer residence of the Bourbons and has 1200 rooms. It was built as a copy of the Palace of Versailles. Campania has some of the most charming places of Italy within its boundaries: Vesuvius, the imposing volcano that is surrounded by full, flourishing vegetation, the Amalfi Coast and the Sorrento Peninsula, with their wonderful beaches and captivating fishermans villages. There are also the regions islands, treasures of nature and architecture surrounded by crystal clear seawater. The coastline boasts some famous places, full of charm, such as Positano, the setting of the summer Dolce Vita in the 1960s, Ravello, a place loved by artists and intellectuals such as Greta Garbo and Richard Wagner, Vietri and many others too. The most famous islands are Ischia, which has one of the greatest number of thermal spas in the world and Capri, with its three stacks and timeless charm. In addition to the sea and these romantic towns, we also suggest you spend some time on nature tours, visiting, for example, the Punta Campanella Nature Reserve, in the Bay of Ieranto and the famous Emerald Grotto. Whenever one talks of Neapolitan and Campania food, it is just impossible to not start with pizza, the dish invented around the end of the 19th century by a Neapolitan cook and which then became famous worldwide. Pizza, the real thing of course, is made using two typical Campania products: San Marzano tomatoes and fiordilatte mozzarella cheese. Pizzas can be tried plain or with other ingredients on top. There are other tasty seafood dishes prepared along the coast and on the islands, such as pepata di cozze made with mussels and desserts such as the famous pastiera. And of course we cannot forget the famous, locally-made Limoncello di Sorrento, a delicious lemon-based liqueur.